Reinalda Pires is one determined woman. 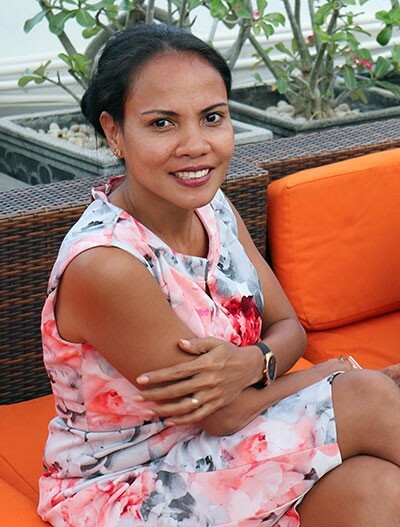 Her focus, courage and persistence have guided her from a small village in her native Timor-Leste to a varied, challenging career and a university degree. Born in a small village in Baguia, near Timor-Leste’s northeastern tip, she attended school in Viqueque, roughly 180 km from the nation’s capital of Dili. “My family had limited means. I was the oldest girl in the family and wanted to go to school because my parents worked hard for me to have that opportunity,” she said. University wasn’t an option, so Reinalda moved to Dili to find work. “I started as a waitress so I could help my parents out, but I knew I could do more,” she said. Reinalda with her family (including puppies): husband Celestino Soares, son Morreno Soares and daughter Michelle Soares. At the time, there were numerous United Nations (UN) organizations and staff operating in the country. Timor-Leste became an independent nation in 2002, following over 400 years of Portuguese colonization, 24 years of Indonesian occupation, and three years of UN transitional administration. After her UN position, Reinalda held a variety of roles with local and international nongovernmental organizations, as well as the Australian Embassy and the U.S. Agency for International Development. One day she saw an ad for a business services administrator position with ConocoPhillips. She had never heard of the company or the Bayu-Undan project, and she felt uncertain about applying. She shouldn’t have been. The panel was so impressed they were willing to wait for her to finish her current commitment and give birth to her first child. In April 2009, Reinalda joined ConocoPhillips. During this time, Reinalda was finally able to think about attending university, thanks to ConocoPhillips’ employee education assistance program. In her current role as purchasing officer, Reinalda seeks to increase the number of local suppliers providing goods and services for the Bayu-Undan joint venture project. Reinalda was the first Timorese employee to apply and be accepted for education assistance. She began work on her degree in management marketing at the University of Bina Nusantara in Jakarta, Indonesia, studying online. “I really struggled, as I was pregnant with my second child and had just started the new position of finance assistant. Deadlines were very tight and it was a busy job, given my school assignments and my daughter to look after,” she said. Around that time a new role of purchasing officer was created. Out of 200 applicants, Reinalda was the successful candidate. The role was created to help ConocoPhillips increase its number of local suppliers providing goods and services for the Bayu-Undan joint venture project. As purchasing officer, Reinalda engages with local suppliers, assesses their capabilities and ensures they comply with the company’s procurement policies. Reinalda’s courage and can-do approach have enabled her to expand her reach into areas such as government affairs, external relations and community investment. She is also the ConocoPhillips Women’s Network lead in the Dili office, championing diversity and inclusion at a local level. Reinalda also cites her family’s never-ending support as a major factor in her success. ConocoPhillips established an office in Timor-Leste in 2006. The company operates the Bayu-Undan joint venture project with partners Santos, Inpex, ENI, Tokyo Timor Sea Resources, a consortium of Tokyo Gas and JERA. Petroleum resources were developed with the governments of Timor-Leste and Australia. In 2014, the Dili office expanded its activities to include a local hub for continued development of engineering activities in Timor-Leste. 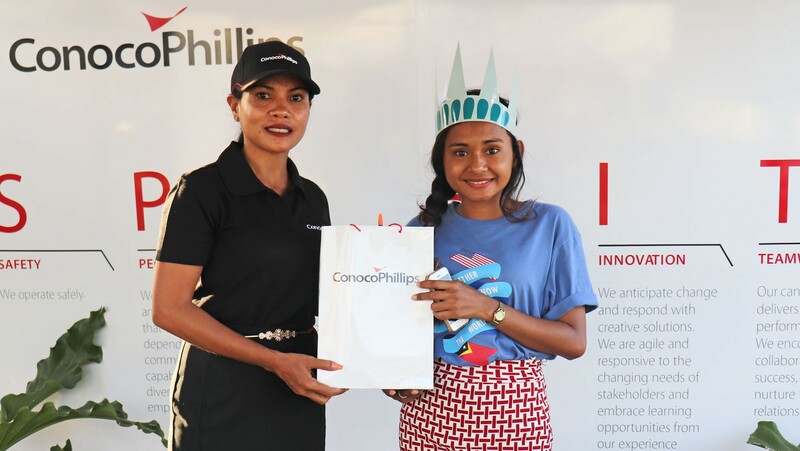 Reinalda represented ConocoPhillips at the U.S. Embassy’s annual Fourth of July event in Dili. The team greeted guests and handed out giveaways, such as this one to a local university student. This is one of many community events, including volunteer days and donation drives, that Reinalda is involved in throughout the year.